1988 BFA, Sir J.J. School of Arts, Mumbai. 1990 MFA, Faculty of Fine Arts, M.S. University, Baroda. 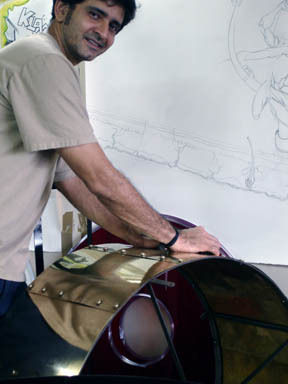 2005 Willing Suspension, Gallery Chemould, Mumbai. 2007 Shanghai Contemporary Art Fair, presented by Gallery Chemould, Mumbai. New Narratives: Contemporary Art from India, Exhibit Hall and Sidney R. Yates Gallery, Chicago Cultural Center. Gulf Art Fair, presented by Gallery Chemould, Mumbai. Making un-Making Objects, curated by Vidya Shivdas, Vadehra Art Gallery, New Delhi. Destination Asia, curated by Sharmila Samant, Almaty. Classe de Danse, curated by Alessio Fransoni and Ilari Valbonesi, Bern. 2006 Edge Of Desire: Recent Art in India, curated by Chaitanya Sambrani, traveling exhibition, USA and India. Subcontingent The Indian Subcontinent in Contemporary Art, curated by Ilaria Bonacossa and Francesco Manacorda, Fondazione Sandretto Re Rabaudengo, Torino. Hungry God: Indian Contemporaries, Arario, Beijing. Hungry God: Indian Contemporaries, Busan Museum of Modern Art, Busan. Bite The Mango, curated by Johan Pijnapple, National Museum of Photography, Film and Television, Bradford. 2005 Video Art from India, curated by Madhushree Datta, SESC, Pinheiros, Sao Paulo. Monument for Kala Ghoda, Kala Ghoda Art Festival, Gallery Chemould, Mumbai. Are We like This Only, curated by Vidya Shivdas, Vadehra Art Gallery, New Delhi. Screening of ‘Jataka Trilogy’ single channel video at the cultural program, curated by Johan Pijnapple, Ecole Nationale Superieure des Beaux-Arts de Paris. 2004 Home With No Walls, curated by Open Circle, World Social Forum. 2003 Video Show, curated by Sharmila Samant, Gallery Chemould, Mumbai. Sites of Recurrence II, curated by Tamara Malmestrom, Elisabet Haglund (India Sabka video compilation), Boras Konstmuseum, Boras. Outside Wall, public screening, Lund Art Hall, Lund. Ideas and Images, curated by Paromita Vohra, National Gallery of Modern Art, Mumbai. I love My India, curated by Johan Pijnapple, Total Museum, Seoul. 2002 Alchemy, curated by Arshiya Lokhandwalla and Kelly O’ Reilly, The Stephen Lawrence Gallery, London. Aar Paar a public art project, cross border exchange and exhibition of posters, curated by Shilpa Gupta and Huma Mulji, Karachi. Video Festival, curated by Sharmila Samant India Sabka Youth Festival. 1999 Icons of the Millennium, Lakereen Gallery for Contemporary Art, Mumbai. 1998 Edge of the Century, curated by Amit Mukhopadhayay, Vadhera Art Gallery, New Delhi. 1997 Collaborative Space, a collaborative installation with Kausik Mukhopadhayay,Y.B. Chavan Centre, Pundole Art Gallery, Mumbai. Gift for India, travelling exhibition organized by SAHMAT. 1996 10 Years of Cinema, Group Show, Lakereen Gallery for Contemporary Art, Mumbai. 1995 Young Contemporaries, Lakeeren Gallery for Contemporary Art, Mumbai. Group Show, Gallery 88, Calcutta. 1993 Group Show, Pundole Art Gallery, Mumbai. 2005 Majlis Fellowship for the Arts. 1998-2000 Residency at the Rijksakademie van Beeldende Kunsten,Amsterdam. 1995 Inlaks Scholarship for Sculpture. 1990- 1992 Fellowship award Kanoria Centre for Art.